Yesterday evening the Prosecution of Serious Crimes arrested 18 customs officials from Qafë-Thana, Tirana, and the port of Durrës. The 18 officials are accused of collaboration in the transport of 10 tons of drugs from Albania to Italy. The first case was on February 5, 2017, when a truck containing 8 tons was captured in Italy. 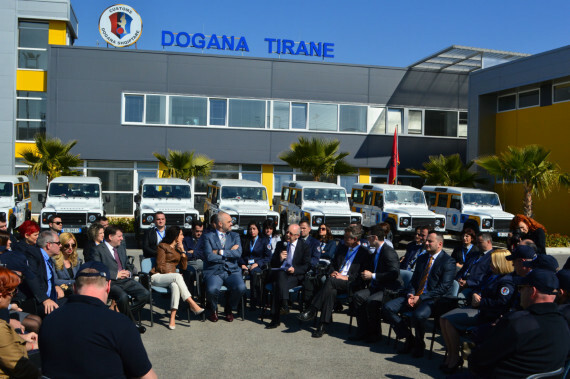 The truck had entered Albania from Macedonia at the border crossing of Qafë-Thana, and passed the port of Durrës on the way to Italy. The second case was on March 24, 2017, when a truck with 2.2 tons of marijuana was captured, again in Italy. The officials that were arrested are customs officers, anti-drugs specialists, and the police chief of the port of Durrës. The fact that these individuals were wide-spread and working at several different customs offices, all related to several drug transports shows that we are not dealing with individual crimes but with crime that is endemic and has, in fact, captured the state. Above all, the arrests prove that the the public accusations and opinion that the cultivation and massive trafficking of cannabis wouldn’t be possible without the collaboration of state structures. They explain why large shipments of drugs, up to several tons, are discovered and captured by the Italian police, whereas they easily pass across Albanian territory and through border controls. The arrests are the strongest proof so far that confirms the accusations of the opposition and the media that drug trafficking in Albania happens in collaboration with and under the protection of governmental institutions, especially high officials of the State Police and the Ministry of Interior Affairs. The cases brought against the arrested officials are only the tip of the iceberg. The extensiveness of the network and collaboration of the people in it suggests that it has operated for a long time. The arrests show that we are not dealing with separate individuals related to drug trafficking, but with state structures that have turned into links in international drug trade. The institutions that are supposed to protect and control two major Albanian border crossings have basically operated like an organized criminal group. They are a witness to the fact that crime is not only widespread in state institutions but has in fact captured them, putting them into its own service. The arrests are a serious blow to Prime Minister Edi Rama because they annihilate his claims that he has consolidated the state and has change the Albanian police into the most trusted state institution. That the main directors of the structures that protect our borders, those of customs and the police, collaborate in an organized manner with crime is the end of the state. In particular, the arrests may be interpreted as a blow to former Minister of Interior Affairs Saimir Tahiri, who has often been accused by the opposition and the media of links with organized crime and drug trafficking. Finally, the arrests show that the battle against drugs requires the police and other state structures to be cleaned from criminal elements. But considering the fact that high-level officials have been suspected or accused of having criminal ties, this appears to be a difficult task without changing the directors at the Ministry of Interior, the police, customs, and other state institutions.